Lavender Aphrodisia: Glycine Soya (Soybean Oil), Sucrose, Fumed Silica, Glyceryl Monostearate (and) PEG-100, Octyl Palmitate, Sodium Laureth Sulfate, Silicone, Glycerin, Methylchloroisothiazolinone (and) Methylisothiazolinone, Amyris Oil, Balsam Copaiba Oil, Basil Oil, Eucalyptus Oil, Lavandin Grosso Oil, Lemon Oil, Nutmeg Oil, Patchouli Oil, Tocopherol, Prunus Armeniaca (Apricot) Seed Powder, Tocopheryl Acetate, Tritum Vulgare (Wheat) Germ Oil, D&C Violet 2, Aluminum Lake Red 33, Aluminum Lake Red 40, Aluminum Lake Blue 1. Vanilla Lemongrass: Glycine Soya (Soybean Oil), Sucrose, Fumed Silica, Glyceryl Monostearate (and) PEG-100, Octyl Palmitate, Sodium Laureth Sulfate, Silicone, Glycerin, Methylchloroisothiazolinone (and) Methylisothiazolinone, Lemongrass Oil, Grapefruit Oil, Lemon Oil, Peppermint Oil, Vanillin, Tocopherol, Prunus Armeniaca (Apricot) Seed Powder, Tocopheryl Acetate, Tritum Vulgare (Wheat) Germ Oil, Aluminum Lake Yellow 5, Aluminum Lake Red 40, Aluminum Lake Yellow 6. 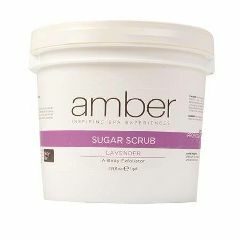 Amber's Sugar Scrub contains pure sugars to naturally renew complexion and exfoliate dead skin cells. Ideal for delicate and sensitive skin types. Sugar Scrub effectively prepares skin to absorb vital nutrients from masques and serums leaving skin with a healthy glow. Available in Lavender Aphrodisia and Vanilla Lemongrass.